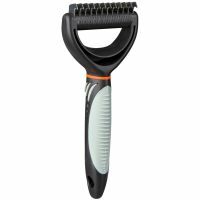 Trixie Universal Curry Comb | Free P&P on orders £29+ at zooplus! grooming :"this product is amazing, i have 3 long haired Newfoundlands. and this curry comb is our best frind"
This Trixie Universal Curry Comb has been developed for long haired pets but is also ideal for caring for all fur types. This comb is perfect for detangling your pet's fur and removing any knots or mats easily and effectively. Small knots can be carefully cut out and removed from your pet's fur. You can also smooth out both the top- and undercoat. Your pet's fur has a new shine to it and healthy healthy and shiny. The robust plastic handle with anti-slip rubber cover makes it comfortable in your hand and easier to work with. The prongs are 1cm long and the larger comb they are 5mm apart. Best grooming product I have brought! This is quite simply the best grooming tool I have brought. When purchasing this product, I also purchased a cat furminator. I wish I hadn't bothered with the furminator, as with this tool it is obsolete. I use this on my short haired GSD, 2 long haired cats and 1 short haired cat weekly. Each time it gets loads of undercoat out without damaging the top coat or the guard hairs on my GSD. Simply and easy to use and all my animals are happy to sit with this tool compared to others I have tried. I had already brushed my one year old Briard thinking I'd done a good job. Then this arrived and I thought I'd give it a try, wow, I got so much more hair off of him that it looked like an ewok has spontaneously exploded in my garden. My dog looks so much better and feels silky smooth. I would definitely recommend it to anybody with a hairy little monster like mine. We have two dogs, a Shih tzu and a rescue dog which has a westie body and border collie head with a very dense thick coat. He's been a constant night mare and usually ends up with a number one shave all over every 8 weeks. My groomer got sick and Sparky got hairy very quickly, he's not very good with strangers and so taking him to another groomer wasn't fair. I brought this comb and wow.. We can now grow his coat for winter knowing this comb gets through all his layers of fur. Gets all the matts without upsetting him.. Highly recommend this brush and zoo plus only wish they did his dog food on this web site. My dogs are kept thoroughly groomed, using undercoat rake, slicker, various widths of comb, shedding blade, etc etc...thought there was not much more to come off them. I bought this as I wanted to try something else on my VERY hairy collie-type, but couldn't justify the £30 certain other tools cost. All I can say is, wow...on first using this there was fur everywhere. Would say it's best to make sure the dog is thoroughly brushed/combed out first though, as otherwise this tool can be inclined to cut the topcoat, which isn't what you want. And my housemate has learned not to use it on tails!! :D Very effective as a tool to strip excess hair out of an already well-groomed and knot-free dog though. I have a English Springer and a Sprocker this item just makes it so easy to keep their coats well groomed, am going to buy another one. Have an English springer spaniel who was in need of a good groom, as he had so much dead fur & other combs did`nt seem to touch him so we brought the universal curry comb (large) & its fantastic!! with just one good groom so much fur came out looks he like a new dog he even seemed to enjoy it.Will reccommend to other pet owners & will buy from zooplus again.Well worth the money. Have an English Springer Spaniel who needed a good groom, other brushes did`nt seem to touch him so we brought the large curry comb, it is fantastic!! with just one good groom so much dead fur came out,he even enjoyed it.He looks like a different dog.will reccommend this site to other pet owners & will be using again. Recently, my dog is losing lots of his juvenile hair. so, it was tangled and matted. Every time I combed him. He looked unhappy. So, I ordered this item. He still doesn't like combs. But he prefer this one. And It remove dead hair efficiently and quickly. At the first using, I was surprised because I hadn't known there was that much dead hair. After, one combing on whole of the body, combing became much easier and not that much hair is coming out. I think just one time a day combing could keep Walter(my dog's name) handsome and clean. Does what it says. I have the large & the small version. I prefer the small version better as it is easier to handle when dematting. I've also removed alternate blades from the small one as I find it more effecient when the matts are very dense. Good quality & lasts a lifetime. 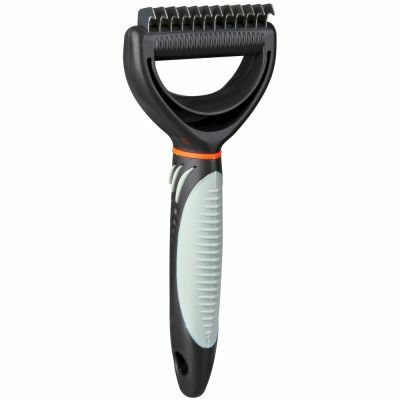 I got 1 for our cavalier,Ralph.A keen swimmer,matts in his ears were a battle!People recommended the Mars coat king as the solution.This curry comb costs 1/4 of the price & does a super job.It gently pulls out dead hair effortlessly & breaks through matts with ease & is comfortable to hold.Great tool for summer,removing dead undercoat leaves the dog feeling cooler & quicker to dry as a result.He really enjoys having this done,no hiding under the table!Big paws up for a great value product!